Lots of local organizations ask for coverage on “06880.” They want me to promote their events, fundraisers and what-not. First Night is different. I’ve never received a personal email or call from anyone associated with Westport’s annual ring-in-the-new-year festival. Some years they don’t even send a press release. So I’m doing their job for them. Here’s what’s going down December 31. This is First Night Westport’s 22nd year. It’s one of only 2 First Night celebrations left in Connecticut (the other is in Hartford). Municipal and corporate donations have slumped. In fact, they’re waaaay down. But a small corps of volunteers slogs on. They sign musical acts, magicians and ice carvers; arrange carriage rides, bonfires and fireworks; find venues, design buttons and sell tickets — all so families can enjoy a fun, alcohol-free New Year’s Eve. Then they spend days staring at weather reports, praying a blizzard or deep freeze won’t scuttle their work. It works. Last year’s turnout set a record. 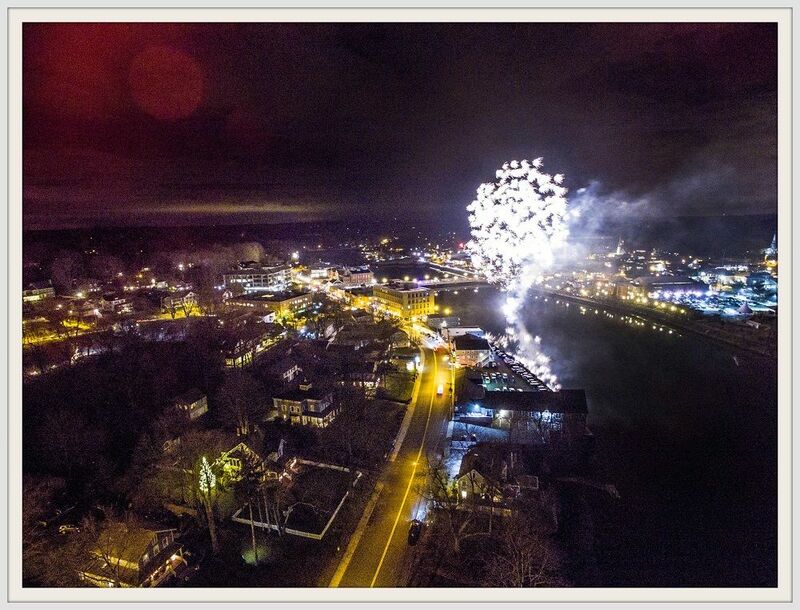 John Videler’s drone captures the First Night fireworks over Westport. This year, over 25 performances take place at 10 sites. Chris Coogan returns, as do the Washboard Slims, and Dennis the Train Man. There’s comedy, drama, dancing, and music from rock to Broadway. Buttons go on sale Friday (December 2) at the Library, Town Hall, Westport Historical Society, Saugatuck Sweets, Trader Joe’s and Weston Hardware, or online here. They’re $10 each ($15 after December 15), and allow entry for everything. Children under 2 are free. Fun fact: Button prices have remained the same since the 1st First Night, back in the (ahem) Clinton administration. Take that, Cablevision! For some reason — perhaps their own low-key approach to publicity-seeking — First Night flies under the radar. Like the fireworks they shoot off in the frigid sky, First Night should soar. This entry was posted in Entertainment, Organizations, Weather and tagged First Night Westport Weston. Bookmark the permalink. Thanks Dan for covering a really wonderful Westport event.